Remember my bad kitchen feng shui? When, about 18 months ago, I decided I couldn’t live another day in a kitchen without a window above the sink? Because who can daydream about not doing dishes while doing just that and staring at a blank wall? Well, I now have that window, plus much more, and it didn’t even take 18 months — more like a year. I just needed six more months to actually write about it. I’m happy to report that my chee* now flows freely westward as I wash countless dishes every day. Freely westward for about 25 feet, until it stops dead at the window a/c unit of our neighbor’s house (6 yards is better than a foot, right?). Anyway, I figured it was finally time for an update, and some pics. Because I really do now love my kitchen, and feel kinda like a proud grandmother whipping out her accordion of wallet-sizes. The ice cream on the proverbial cake of our on-the-cheap reno was my Julia-Child-inspired pot rack. This is perfect in my kitchen — primarily because there is no place to have an overhead-hanging rack like we’ve had in previous houses. We have a 2-foot wall next to our stove that sits at a 45° angle, and it was begging for a large piece of peg board to house my collection of newish-and-vintage pots-and-pans right at arm’s length. 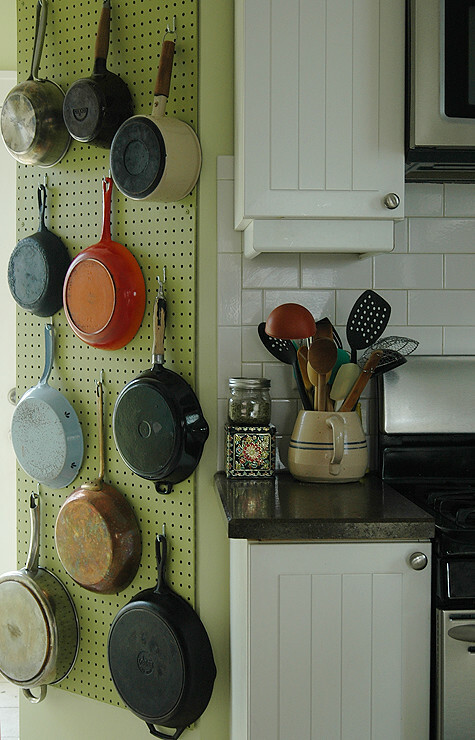 the wall rack allows me to use pans as color in the kitchen — my favorite is the tomato-red vintage Dansk enameled cast iron that my friend Sarah found on a Goodwill run. Granted, my husband did the whole thing (I cook, he fixes things: it’s our agreement). But I totally could have done it on my own. If I’d wanted to. You just need a piece of pegboard from your local hardware store — and if your board doesn’t come with them, make sure to pick up a package of hooks. While you’re there, go ahead and pick out a quart of paint, and some primer will help too (we had primer already, and used a $5 sample paint from Sherwin-Williams that had been a discarded kitchen color). If your board doesn’t come with spacers, you’ll need some small scraps of wood to use for that purpose. Cut your board to size, and prime/paint it. Then using 1/4″ spacers (the board can’t sit flush on the wall, or the hooks won’t go through the holes — we made this mistake in our previous home’s laundry room), screw the board to studs in your wall. Tim used 8 screws for our 2×5.5′ board. Touch up any paint flaws (paint over screws), let dry, and arrange hooks as needed. Julia drew the outlines of her pots on her board with a black sharpie, but I just can’t commit like that. Voila. Pot organization, kitchen color, efficient use of space, dirt cheap. What more could I ask for. Check back for a future reno post featuring: The Window, and The World’s Trendiest Backsplash. * I know, I know. It’s qi. But even with a reno’d kitchen, I’m still as low-brow as I was in 2010. I too love that kitchen of yours…..only you (with Tim’s help) could pull it off so beautifully! What a fantastic use of space! Yes, I love this. And I absolutely love the color you painted your pegboard. It speaks of Julia without going totally 60’s puke-y colors. I love your peg board wall. What a great idea. I haven’t ever seen Julia’s example. It looks like it is flush to the wall. Where are the spacers installed? How many spacers are there? I am so going to do this. Heidi, the spacers are right behind each screw. They are only 1/4″, it’s hard to see in the photo but there is a space there. The screws are placed in all four corners, plus the sides, about 1/3 and 2/3 of the way down (8 total for our board). You just place a 1/4″ piece of wood between the board and wall, and screw through that to secure. If your board is much wider, you might need an additional spacer/screw in the middle somewhere. Hope that makes sense! Have fun with it! could you get a few more cast iron skillets? Then you will be set. they’re a fetish, I’ll admit it. kinda like 2001’s cake stand. This is beautiful! I may do something like this over the summer. We have the space and the need.